A view of the Kongu FM Community Radio station. 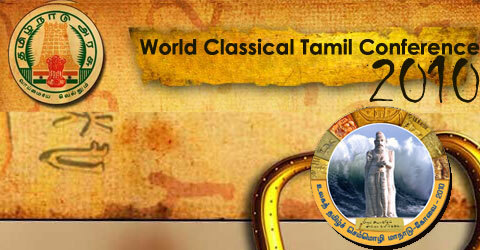 COIMBATORE: Air waves are also abuzz with the World Classical Tamil Conference-related activity. Pioneering it in the city is PSG Community Radio from PSG College of Technology. It’s the only engineering college in the city to host a community radio station. B. Chandrasekaran, Station Director, says the station has been airing ‘Semmozhi Neram’ for the past couple of months. “The programme began in March and is broadcast between 7 a.m. and 7.30 a.m.” Apart from a daily interview with well-known Tamil poets, writers, the station managers have been using the platform to also project upcoming litterateurs. “For instance, we interviewed a construction worker, Sivakumar, who has a few interesting works to his credit,” he says. The jockeys quiz the guests about their works, the reasons behind writing them and their struggle to publish the same. Mr. Chandrasekaran says ‘Isai Tamil’ and ‘Nadaga Tamil’ segments also form part of the ‘Semmozhi Neram’. “There the listeners are told about non-film Tamil music and Tamil drama, both old and contemporary.” So far 100-plus people have been interviewed. On the conference days – June 23 to 27 – the Community Radio is planning to provide live coverage to its listeners, who live within a 12-km radius. In Erode, Kongu FM, a community radio initiative from Kongu Engineering College, Perundurai, has been airing the Conference theme song and interviewing poets of the Kongu region. Programmes on Tamil development have also formed part of the special programme. 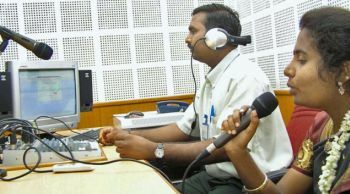 Faculty in-charge of the FM radio K. Thangaraj says it entered into an understanding with Kodai FM to air a few more programmes. Similarly, Erode Sengunthar Engineering College’s Mugil FM has also been airing awareness programmes on the conference. Coimbatore: Over 10,000 police personnel would be deployed for the World Classical Tamil Conference, said Director General of Police, Letika Saran on Monday. Ms. Letika Saran along with Additional Director-General of Police (Law and Order), K. Radhakrishnan along with City Police Commissioner, C. Sylendra Babu and Inspector-General of Police, West Zone, P. Sivanandi addressed the officers drafted from various places on the nature of work, individual responsibilities. Later talking to reporters, Ms. Letika Saran said that police personnel have been drafted from other districts except from Tirupur, Erode, the Nilgiris and Coimbatore Rural considering the work load in these districts. 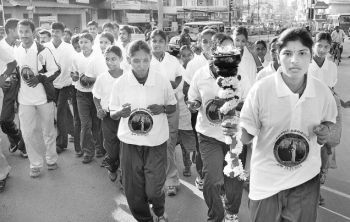 In addition to police personnel, 1,000 Home Guards, 1,000 NCC cadets, 4,000 NSS volunteers and a number of traffic wardens would be deployed. The city police have established “May I Help You” booths at bus stands, railway stations, airport and other public places. The security measures has been drawn up in such a way that buses will ply as usual and there would be no disruption to normal life. Traffic would be allowed on Avanashi Road on all days except on June 23 from afternoon to 10 p.m., the first day of the conference, when the floats procession commences from VOC Park Grounds to CODISSIA Trade fair complex. Ms. Letika Saran and Mr. Radhakrishnan said that for the first time, the police have go in for hi-tech security gadgets as part of the arrangements. Surveillance cameras have been fitted on Avanashi Road, CODISSIA area and across the city. These cameras are hooked to the police control room as well as the temporary arrangement functioning at CODISSIA from the planetarium building. In addition, camera-fitted balloons to fly at 1,000 ft height would maintain vigil for a two to three km radius. Similarly, an Unmanned Aerial Vehicle (UAV), a glider type, battery and remote operated small aircraft fitted with cameras would be flying over Coimbatore maintaining vigil for 15 km to 20 km. On threat perceptions for the meet, Ms. Letika Saran said that whatever intelligence inputs that come across are issued as alerts to the personnel and Intelligence sleuths are closely monitoring those who are opposing the conference. About the announcement of the toddy movement planning to sell toddy at the conference venue, Ms. Letika Saran said that any action contrary to the law will be dealt with seriously. When asked about the blasting of a track near Tindivanam recently and mischief on tracks at Vijayamangalam in Erode district and at Pattabhiram in Tiruvallur district, Ms. Letika Saran said that Erode and Tiruvallur incidents are mischief acts while Tindivanam incident was being investigated. CHENNAI: “Tamil has the gravity of expression that is not present in any other language. Coming to Tamil Nadu is like returning home” said Alexander Dubianskiy, a Tamil Scholar from Moscow State University. Dr. Dubianskiy is part of the Russian delegation that will be participating in the World Classical Tamil Conference. He was addressing media persons at the Russian Centre of Science and Culture here on Monday. He first came to India in 1978, and had pursued research in Tamil at the University of Madras for nine months. He has more than 100 publications to his credit which include a translation of classical Tamil poetry into Russian, and a book in Russian on Tamil poetry. He has written essays on Tholkappiyam and Silapathikaram which he expects to publish soon. On the need to foster better ties between India and Russia, Vladimir V. Mariy, Director of Russian Centre of Science and Culture, talked about reducing the barriers of language and culture by increasing interaction and exchange between both countries. 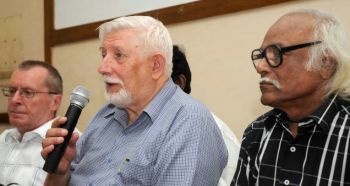 “Our great leaders were good friends with the Soviet Union, and our friendship with Russia symbolises the age-old relationship,” said D. Jayakanthan, writer and founder chairman, Indo-Russian Cultural and Friendship Society. P. Thangappan, Secretary General, Indo-Russian Chamber of Commerce and Industries, called for developing co-operation in arts and education between two countries by intensifying inter-university collaboration and promoting Russian language and culture. He added that Russian would be taught in 10 colleges across Tamil Nadu this year. Video conferencing sessions would also be hosted at the Russian Centre of Science and Culture here to enable students of Tamil in Moscow to have access to the lectures of Tamil scholars. V. M. Lakshminarayan, Chairman, Indo-Russian Chamber of Commerce and Industries, and Tatiana Perova, Director of Russian Language Institute were also present during the media interaction. Showcasing culture:Badagas rehearsing for the World Tamil Meet in Udhagamandalam on Friday. 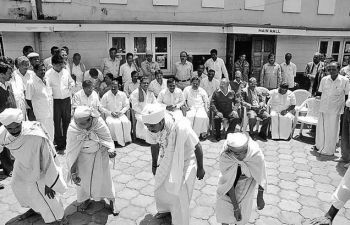 Udhagamandalam: Long considered to be a prominent and unique feature of the Blue Mountains (the Nilgiris), the Badaga dance is set to enthral participants at the World Classical Tamil Conference scheduled to get underway at Coimbatore on June 23. Having been entrusted with the responsibility of showcasing the colourful and graceful dance at the prestigious meet, the Young Badagas Association (YBA) is leaving no stone unturned in ensuring that its contribution to the success of the event is significant and memorable. The rehearsals which began earlier this week gained momentum on Friday with the Union Minister for Communications and Information Technology A.Raja spending some time with the members of the dance troupe within the premises of the YBA. Speaking to The Hindu, the President, YBA T. Gundan said that 50 dancers including 20 women have been selected from various Badaga villages in the ‘Nakku seemai’ (four directions of the district). Stating that their cultural programe will last about seven minutes, he expressed the confidence that it will remain etched for long in the memory of the delegates from various parts of India and abroad. He added that arrangements have also been made for the participation of Badagas in the meet. Coimbatore: Chairman of the Transport Arrangements Committee and Minister for Highways and Minor Ports M.P. Saminathan on Saturday said that adequate transport arrangements have been made for the visitors and delegates. Mr.Saminathan said that allotment of vehicles for the visitors and participants, Volvo buses for the delegates, vehicles for the convoy of important persons, deployment of vehicles at Tiruchi and Madurai airports to pick up the delegates and bus and mini buses for cultural teams had been completed. Tamil Nadu Tourism Development Corporation was arranging air-conditioned Volvo buses for the overseas delegates. Mr.Saminathan told reporters that 15 special buses from Puducherry, 20 from Bangalore, five from Palakkad and five from Mysore would be operated. From other important places in Tamil Nadu, as many as 270 buses would be operated and in total 315 buses would be in operation every day. In Coimbatore city, 50 buses would be operated connecting all the bus stands on a circular route. Nineteen buses would be plied from Gandhipuram to Singanallur via Hopes, 10 buses from Mettupalayam Road bus stand to Singanallur on the same route and 10 buses would be operated from Kalapatti parking to SITRA. In addition, 50 special buses would be operated to Coimbatore from the neighbouring areas. There would be two special trains on Coimbatore – Chennai sector and one train from Kanyakumari to Coimbatore. Efforts were on to have one more special train between Thanjavur and Coimbatore. Sleight of hand:P. Sakthivel (left) and G. Babu Charles with the 8000-page Tamil literary work produced by them.